Conflict of Interest This new definition takes the place of the previous definition Interested Party. The new definition is broader in that it includes the perception that a person may have a personal or financial interest that could affect their ability to be impartial. This new definition is the cornerstone of the revised rule 63.4 (Conflict of Interest). Party This definition has been expanded to include the new “technical committee” (see new rule 92, Technical Committee) which can protest under rule 60.4 (Right to Protest; Right to Request Redress or Rule 69 Action), a person presenting an allegation under rule 69 (Misconduct), and the new support person when they are subject to a hearing under new rule 60.3(d). Support Person This new definition is part of the significant change that has brought people who support competitors under the jurisdiction of the racing rules, and makes them and the competitors they support liable for penalty if they do not comply with the rules or if they act in a way that is considered “misconduct.” See in particular rule 3 (Acceptance of the Rules), rule 60.3(d) (Right to Protest; Right to Request Redress or Rule 69 Action), rule 64.4 (Decisions Concerning Support Persons) and rule 69.1(a) (Obligation not to Commit Misconduct; Resolution). The definition includes, among others, parents and coaches. Rule 2 (Fair Sailing) has been changed such that the penalty for breaking it can now be either disqualification (DSQ) or DSQ that is not excludable (DNE). This may result in the rule being applied in more circumstances than before when the only option for penalty was DNE. Rule 3 (Acceptance of the Rules) now creates a “contract” that by participating or intending to participate in a race conducted under The Racing Rules of Sailing, not only are the competitors agreeing to be governed by the rules as before, but so is each “support person” (see the new definition Support Person ). Furthermore, each competitor is agreeing, on behalf of their support persons, that their support persons are bound by the rules, which makes the support persons and the competitors they are supporting liable for penalty if they do not comply with the rules or if they act in a way that is considered “misconduct” (see rule 69.1, Obligation not to Commit Misconduct; Resolution). Finally, each competitor, boat owner and person in charge of the boat is agreeing to ensure that their support persons and crew are aware of all the rules (including those in the notice of race and sailing instructions), meaning support persons cannot escape penalty by claiming they did not know the rules. Part 2 (preamble) Now if a boat breaks rule 14 (fails to avoid contact when reasonably possible) when not racing and the incident results in injury or serious damage, even to herself, she is expected to retire, or be liable to disqualification, from the race sailed nearest in time to the incident (see rule 36, Races Restarted or Resailed and rule 64.1, Penalties and Exoneration). The rules of Part 2 (which include rule 14 ) apply between boats that are sailing in or near the racing area and intend to race, are racing, or have been racing. So boats must be very careful when sailing in or near the racing area before or after a race or risk DSQ if they cause serious damage or injury. Rule 18.2(d) (Giving Mark-Room) Rule 18.2(d) provides a “shut off” time for when a boat is no longer entitled to mark-room under rule 18.2(b) or room under rule 18.2(c) and therefore is no longer “protected” by rule 21 (Exoneration). The “shut off” time is when the boat has been given mark-room, which is when she has been given the space she needs to round or pass the mark on the required side as needed to sail the course, and has been able to sail close to the mark when her proper course would bring her close to the mark. Rule 18.3 (Tacking in the Zone) is significantly different from the previous rule 18.3. First, it only applies at a windward mark being left to port. This means that when the windward mark is to be left to starboard (such as in team racing), there is no special rule about tacking in the zone, such that if a boat tacks onto port tack in the zone, a boat clear astern is only entitled to mark-room if, when she establishes an inside overlap, the outside boat is able to give her mark-room (see rules 18.2(a) and 18.2(f)). Secondly, new rule 18.3 only applies between a port-tack boat that has tacked in the zone and a boat that has been on starboard-tack since entering the zone. So no longer does rule 18.3 apply between two port-tack boats which both tack in the zone. Rule 19.1(b) (Room to Pass an Obstruction) closes a loophole that few sailors were aware of, and keeps the game being played the way sailors currently play it at marks. The loophole was that, between three port-tack boats rounding a leeward mark to port, the outside-most boat is an “obstruction” to the two inside boats because they each are required to keep clear of her under rule 11 (windward-leeward). So while the middle and the outside boat were required to give the inside boat mark-room under rule 18.2(b), the inside boat was required to give the middle boat room to pass between her and the outside boat (the “obstruction”) under previous rule 19.2(b). That undesirable conflict has now been removed. Rule 20 (Room to Tack at an Obstruction) The subtle change in rule 20 is that a boat that has been hailed for room to tack must respond by either tacking or replying “You tack,” even when the hailing boat is not approaching an obstruction. The hailing boat breaks rule 20.1(a) if she hails when she is not approaching an obstruction (and possibly rule 2, Fair Sailing, if she does so intentionally); and the hailed boat can certainly protest after giving the hailing boat room to tack. However the rule writers thought it was safer to require the hailed boat to give the hailing boat room to tack whenever she was hailed, as opposed to giving the hailed boat the right to ignore the hail when she thought the hailing boat was not actually approaching an obstruction. Rule 21 (Exoneration) has been moved from Part 2, Section C (At Marks and Obstructions), where it just applied to incidents at marks and obstructions, to Section D (Other Rules), where it now applies to any incident where the keep-clear boat is entitled to “room” of any kind, including room under rule 15 (Acquiring Right of Way) and rule 16.1 (Changing Course). The significant aspect of rule 21 is that a boat can be exonerated for breaking a rule without the protest committee (PC) needing to decide that she was compelled to break the rule by another boat which was breaking a rule. In other words, she can be exonerated without the PC needing to penalize the other boat. This allows right-of-way boats to change course and acquire the right of way near keep-clear boats without either boat being penalized as long as the right-of-way boat does not cause contact or any unseamanlike maneuvers by the keep-clear boat. Rule 22.3 (Starting Errors; Taking Penalties; Backing a Sail) now says that if a boat backs her sail and as a result is moving sideways to windward, she shall keep clear of a boat that is not doing so. This is called “crabbing” and is an effective technique in dinghies on the starting line to move the boat away from a boat to leeward. Rule 24.2 (Interfering with Another Boat) has previously prohibited boats from interfering with boats that are taking a penalty or sailing on another leg. Rule 24.2 has now added to this list boats that are OCS and are returning to start. The rule has also added an “if reasonably possible” clause to give protest committees some flexibility in applying the rule. And the rule has clarified that this rule does not apply to boats sailing their proper course after the starting signal, meaning it always applies before the starting signal. 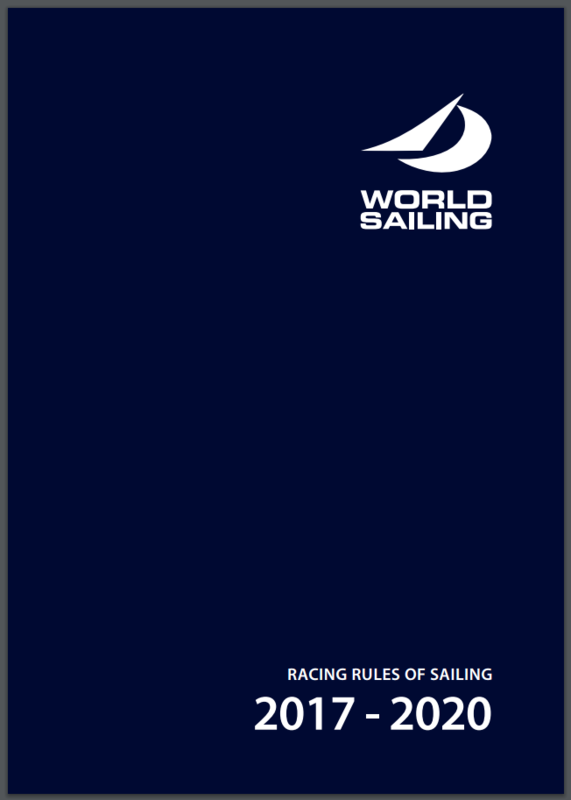 Rule 30.3 (U Flag Rule) This starting penalty rule has been brought forward from Appendix L (Sailing Instructions Guide) into Part 3 (Conduct of a Race) because it is being used more frequently by race committees as an alternative to the Black Flag Rule (rule 30.4). When the U flag (red and white squares) has been displayed (see rule 26, Starting Races), no part of a boat’s hull, crew or equipment shall be in the triangle formed by the ends of the starting line and the first mark during the last minute before her starting signal. If a boat breaks this rule and is identified, she shall be disqualified without a hearing, but not if the race is restarted (e.g., after a general recall) or resailed. Rule 36 (Races Restarted or Resailed) Now, if a boat breaks rule 14 (Avoiding Contact) and causes injury or serious damage while she is racing, she can be penalized in that race even if there is a general recall, or if the race is postponed or abandoned and restarted or resailed. Rule 40 (Personal Flotation Devices) has now added a provision that if flag Y is displayed on shore, competitors must wear their PFD at all times while afloat. Rule 43.1 (Competitor Clothing and Equipment) No longer do equipment inspectors or measurers report possible rule 43.1 breaches to the race committee. That is handled by the new “technical committee” (see rule 60.4, Right to Protest; Right to Request Redress or Rule 69 Action, and rule 92, Technical Committee). Rule 49.2 (Crew Position; Lifelines) has a subtle change. Lifelines, when required, must be “taut” unless a class rule or any other rule, such as the Offshore Special Regulations, specifies a maximum deflection. Rule 55 (Trash Disposal) In addition to its prohibition on competitors intentionally putting trash in the water, which supports the Basic Principle (Environmental Responsibility), rule 55 now states that this rule applies at all times while afloat (which formerly was stated in the preamble to Part 4, Other Requirements When Racing), and that the penalty for a breach of this rule may be less than disqualification. For instance, this will permit protest committees to use their discretion on whether, and how much, to penalize a boat for allowing sail stops to fall in the water after a spinnaker set. Rule 60.2 (Right to Protest; Right to Request Redress or Rule 69 Action) No longer will race committees be in a position to have to protest boats for clothing weight or class rules issues. This is now handled by the new “technical committee” (see new rule 60.4 ). Rule 60.3 (Right to Protest; Right to Request Redress or Rule 69Action) Protest committees can now call a hearing to consider whether a “support person” (see the new definition Support Person) has broken a rule. Rule 60.4 (Right to Protest; Right to Request Redress or Rule 69 Action) New rule 92 (Technical Committee) creates a “technical committee” which includes the responsibilities of the equipment inspector and event measurer, etc. Rule 60.4 gives this committee the right to protest and request redress for a boat. Rule 61.1(a)(4) (Protest Requirements; Informing the Protestee) has been changed to permit a boat to protest without hailing or displaying a flag if as a result of the incident a member of either crew is in danger, and also when it is obvious to the boat intending to protest that there is injury or “serious” damage. The previous rule was more lenient as a boat could protest without a hail or flag when it was obvious there was any damage (not just “serious” damage). Rule 61.2 (Protest Contents) Previously, if a protest did not state “where and when” the incident occurred, the protest was not valid, and that defect could not be corrected before or during the hearing. Often boats inadvertently listed the wrong race or mark rounding and their protests could not be heard. Now, as long as the protest identifies the incident, the “where and when” and other details can be added or corrected before or during the hearing. Rule 64.3(c) (Decisions on Protests Concerning Class Rules) Now when a boat is penalized under a class rule and the protest committee decides that the boat also broke the same rule in earlier races in the same event, the penalty may be imposed for all such races. No further protest is necessary. Rule 64.4 (Decisions Concerning Support Persons) This is the new rule that gives the protest committee the authority to warn or “penalize” a “support person” (see the new definition Support Person). The protest committee can also penalize the competitor for their support person’s actions if it decides that the competitor may have gained a competitive advantage as a result of the breach by the support person, or the support person commits a further breach after the competitor has been warned by the protest committee that a penalty may be imposed. Clearly there have been too many situations where parents and coaches have acted inappropriately, to the detriment of the sport, and this new initiative is designed to try to bring this under control. Rule 66 (Reopening a Hearing) The rule now has a deadline for requesting a reopening on the last day of a regatta, which is within the protest time limit if the party was informed of the decision the previous day, or no later than 30 minutes after the party was informed of the decision on the last day. Rule 78 (Compliance with Class Rules: Certificates) No longer do equipment inspectors or measurers report possible class rule breaches to the race committee. That is handled by the new “technical committee” (see rule 60.4 , Right to Protest; Right to Request Redress or Rule 69 Action, and rule 92 , Technical Committee). Rule 85 (Changes to Rules) is a new rule that pulls together ideas that were in other places in the rule book previously. It states that a rule must refer specifically to the rule being changed and state the change, and that a “change” to a rule includes an addition to it or deletion of all or part of it. Rule 86.1(b) (Changes to the Racing Rules) The significant change in this rule is that now the notice of race (NOR) can change a racing rule. Previously only the sailing instructions (SI) could change a rule. This will require all competitors to read both the NOR and the SI before a race or event. Note, the NOR and the SI are now each required to include all the changes to the racing rules, referring to each rule and stating the change (see rules J1.2 and J2.2). Previously only the SI was required to list the changes in full. Race organizers and race committees will need to ensure that they comply with this new NOR requirement. Rule 87 (Changes to Class Rules), rule 88 (Changes to Prescriptions), rule 90.3 (Scoring) and Appendix A (Scoring) The notice of race (NOR) can now also change class rules which the class permits changing, can change national prescriptions, can specify some other scoring system other than the Low Point System in Appendix A, can state the number of races scheduled and the number required to be completed to constitute a series, and can change the number of races that can be excluded. Appendices B (Windsurfing), C (Match Racing), D (Team Racing), E (Radio Sailing) and F (Kiteboard Racing) each have changes that should be studied carefully for sailors and officials participating in those disciplines. Appendix S (Standard Sailing Instructions) is yet another attempt by World Sailing, in addition to appendices J (Notice of Race and Sailing Instructions) and L (Sailing Instructions Guide) to help race committees write sailing instructions that are error free.